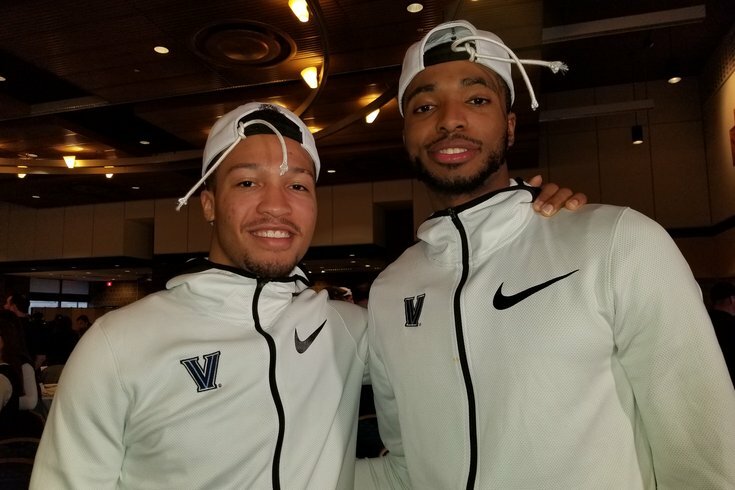 Could Jalen Brunson and Mikal Bridges lead Villanova to their second NCAA Tournament title in three years? The Villanova alums and various supporters that packed into the Connelly Center broke out into an awkward, nervous collective laugh on Sunday evening when Wildcats’ junior Mikal Bridges jokingly asked the crowd and his teammates, "This is a new season and we’re 0-0 now. What do we have, six games left? That’s what it is, six games? We have six games, let’s make it happen." The Villanova basketball team didn’t overreact when the Wildcats, 30-4 and Big East Tournament champions, were announced as the No. 2 overall seed in this year’s NCAA basketball tournament behind No. 1 Virginia, and the No. 1 seed in the East bracket. It was if they expected it. And though Bridges and the Wildcats went into a little scramble mode to kind of whitewash what the 6-foot-7 forward out of local Great Valley High School said, there is a strong, underlying confidence with this Villanova team that it can win its second national championship in the last three years. The Wildcats, who at 7/2 are the betting favorites to win it all according to Westgate LV SuperBook, will open the tournament on Thursday in Pittsburgh at a time to be determined against the winner of Tuesday’s play-in game between Northeast Conference tournament winner LIU Brooklyn Blackbirds (18-16) and the Big South champion Radford Highlanders (22-12). Bridges was a freshman on the Wildcats’ national championship team in 2016. He laughed, when asked if Wright may have twitched a little when Bridges made his kidding proclamation about six more games to play. Bridges did stress that the Wildcats should be battle tested, since three of their last six games reached overtime — with the ‘Cats winning two of the three. 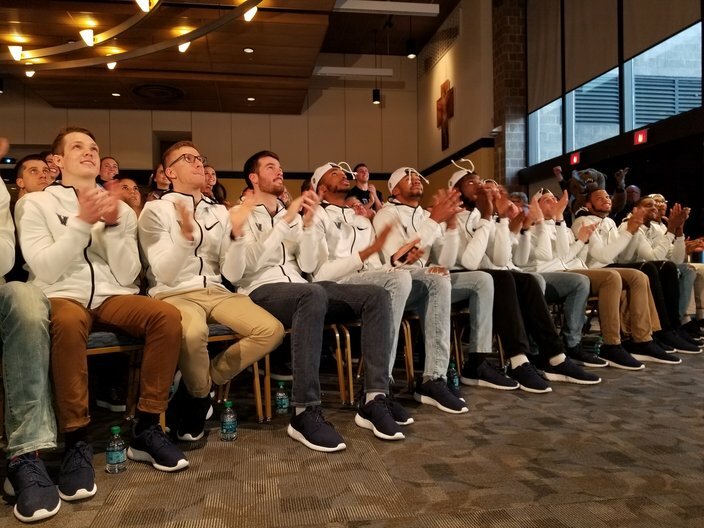 Villanova players react as their seeding is unveiled on Selection Sunday. “Let’s do this game-by-game, and take it like that,” Bridges said. “We don’t build off making shots, we practice on rebounding and defending, and that’s why we got off to the 19-0 start [in the Big East semifinals] against Butler. Situations like that we practice for. Jalen Brunson will be the focal point of the Wildcats. Brunson, the 6-foot-3 all-America junior guard and the team’s captain, said that despite being in the tournament the previous two years, this is a new experience with a new team. “This is definitely a new experience with a new, young group of guys with a new group of leaders,” Brunson said. “What makes me believe in this team is our togetherness. Our chemistry off the court is really helping us on the court. Throughout the past couple of weeks, we’ve been striving to get better and better. Phil Booth was also on the national championship team a few years ago. And they may not be very public with what Bridges said to the gathering after the seedings and matchups were announced on Sunday, but there is an underlying feeling the Wildcats will get six games in this tournament—and maybe some additional hardware to place next to the one that says 2016.